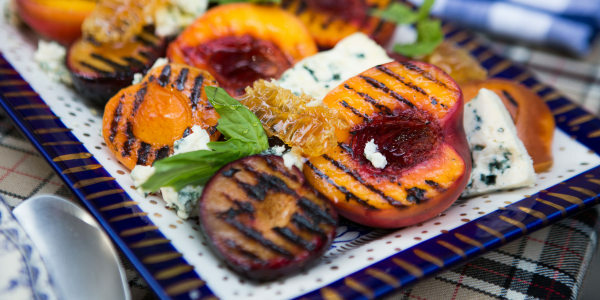 Candy corn is already in stores, but that doesn't mean grilling season has to be over. Heck, we've heard of people in Chicago brushing the snow off their grills to fire them up in the middle of winter. But with Labor Day fast approaching, we're already starting to miss that smell of succulent smoke in the summer air. For a little last minute inspiration, here's a scrumptious selection of 16 of our favorite grilling recipes from 2017, including grilled chicken, beef, shrimp, pork chops, corn, flatbread and even desserts! Still need a grill before you can get started? Check out our roundup of the best grills for cookouts and tailgates. 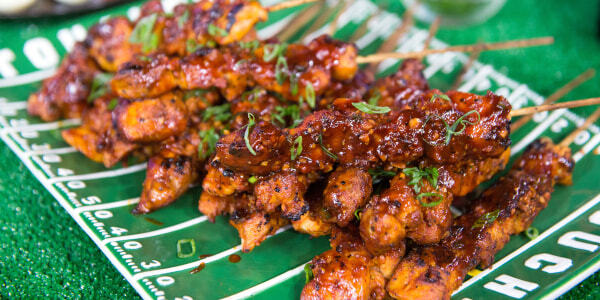 Break out of your barbecue chicken rut with this flavor-packed take from chef Jet Tila. 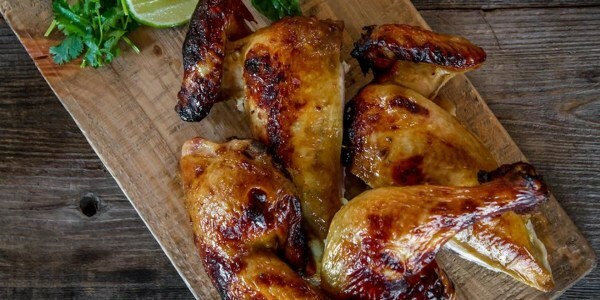 Tila's whole barbecued chicken is seasoned with ginger, garlic, curry powder, coconut milk and lemongrass. This easy recipe from Devin Hashimoto calls for flank steak — a hearty cut that's great for grilling — but the versatile yakitori sauce is also fantastic on grilled chicken, shrimp, tofu and more. For a simple starter or side to go with the skewers, try Hashimoto's Grilled Shishito Peppers with Ponzu Sauce. 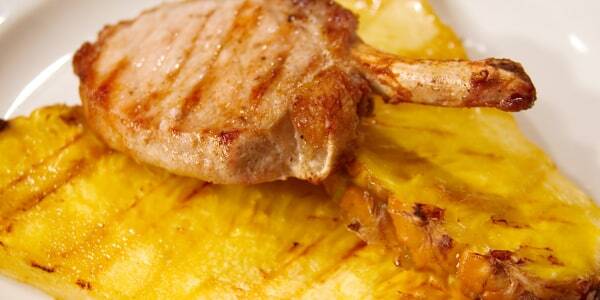 This simple, savory barbecued pork chop recipe just proves to us once again that Al Roker is a true grill master. Need more evidence? 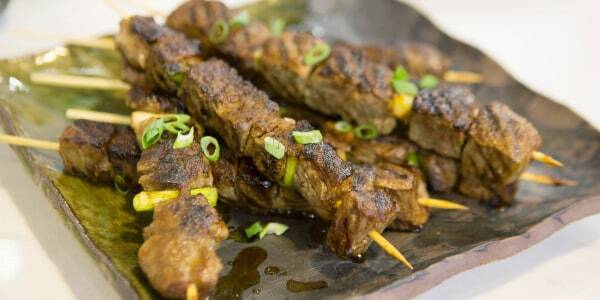 Here are seven more of Al Roker's best grilling recipes. 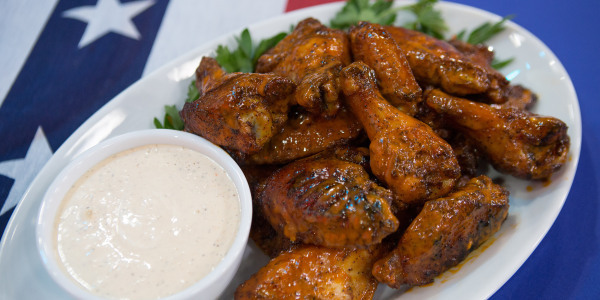 This all-American recipe from Matt Abdoo marries spicy Buffalo-style wings with a creamy Alabama-style barbecue sauce. 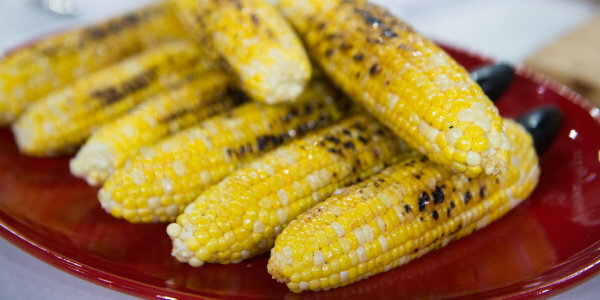 Grilled corn — the ultimate easy barbecue side dish — gets amped up with spicy chili powder and sweet honey in this recipe from Alejandra Ramos. "I love how this corn gives you a combination of sweet, spicy, smoky and salty all in one bite!" says Ramos. 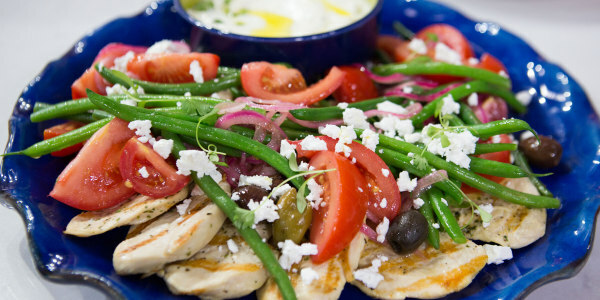 Boneless chicken breasts can be a bit boring, but not in this flavorful and super-healthy recipe from chef Rui Correia. 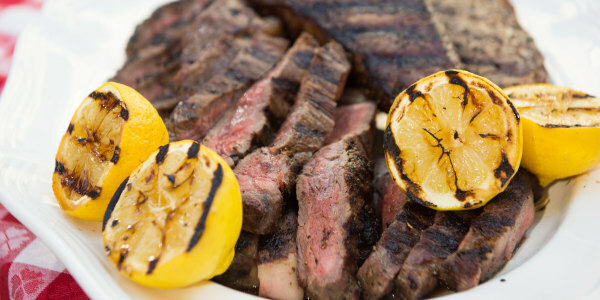 "This is the ultimate in grilling," says chef Tim Love, who shared this recipe, along with 15 tips for grilling the perfect steak. "Mastering a perfect New York strip steak makes you look like a boss anywhere you go." 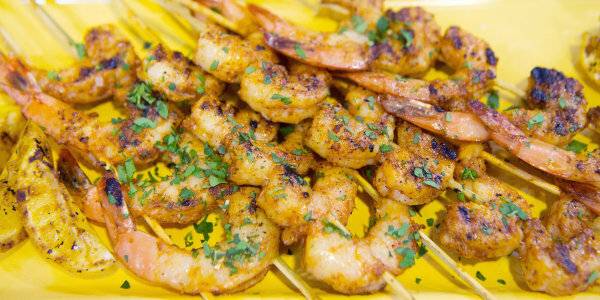 The juicy pineapple and garlicky shrimp complement each other perfectly in this incredibly easy and flavorful recipe from Camila Alves. A simple beer glaze, herbs and plenty of lemon juice perk up juicy chicken thighs in this recipe from musician, chef and TV star Roger Mooking. 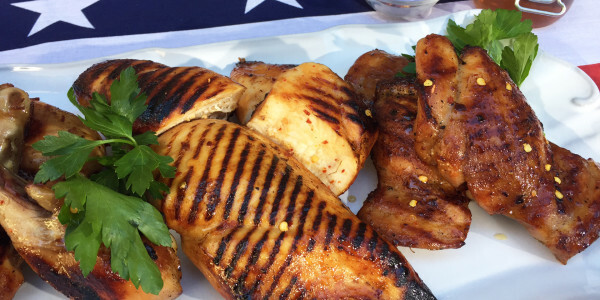 You need just four ingredients (plus the chicken) for the brine, glaze and garnish for this easy recipe for flavor-packed grilled chicken from Sunny Anderson. The brine helps keep the meat incredibly moist — even boneless, skinless chicken breasts, which tend to be a bit dry when grilled. 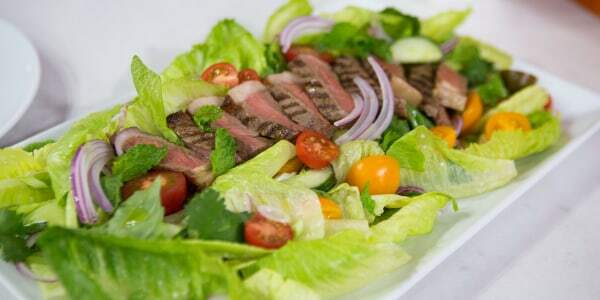 This delicious salad from chef Curtis Stone pairs fresh herbs, crisp greens and veggies with hearty steak for a light summer meal that's also satisfying. The easy Thai-style dressing adds tons of flavor and complements the richness of the meat. 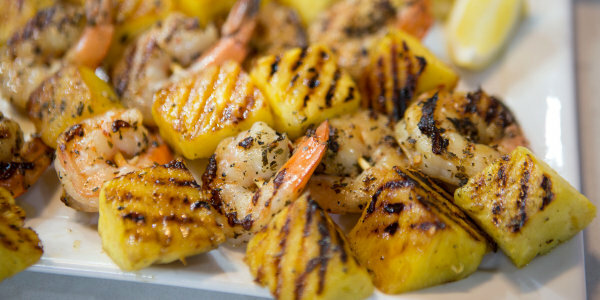 A rich white wine and butter sauce dresses up simple grilled shrimp in this quick recipe from chef Ryan Scott, who also shares his handy trick for keeping the shrimp from curling up when you cook them. Sweet and smoked paprika punch up the flavors in these simple chicken skewers from chef Jennifer Hill Booker. But the real secret weapon is the cola, which helps tenderize the chicken and adds a subtle hint of sweetness. 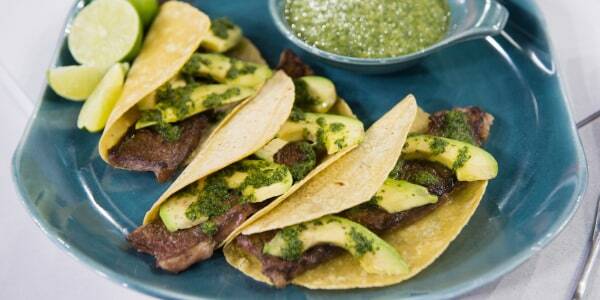 "This recipe reminds me of my hometown of Tijuana," says chef, author and TV personality Marcela Valladolid about this recipe for zesty grilled beef strips served with a bright tasting mint and cilantro salsa verde, corn tortillas and sliced avocado. 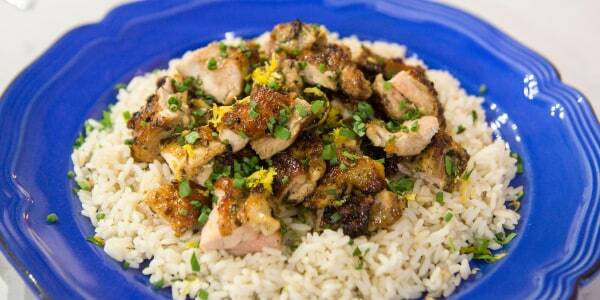 "I grew up with eating this dish, it is one of my favorites. It is a great weekday meal for the family." "The only thing better than pizza is dessert pizza," says Siri Daly, who shared this recipe, along with two savory grilled flatbread recipes. 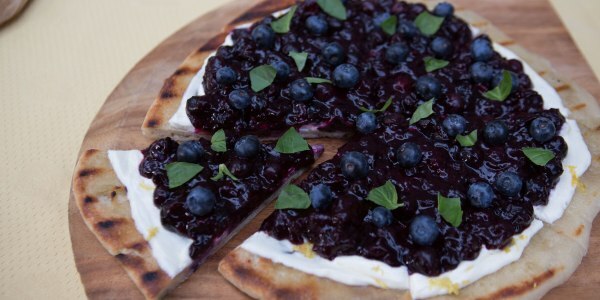 "This grilled flatbread makes summer blueberries shine, especially when paired with the subtle brightness of fresh basil leaves. No pizza is complete without cheese, and this creamy cream cheese base takes this dessert pizza over the top." "When you can't decide between a dessert and a cheese course, make this dish," suggests chef Erin French. "It's a little savory, a little sweet, and perfectly balanced. It's just the thing when the grill's been fired up all day but you're not quite ready to let those hot coals go."